This image shows the installation of the Indigo Electronics AT-4C Fresh Water Cooling System on an Atomic 4. 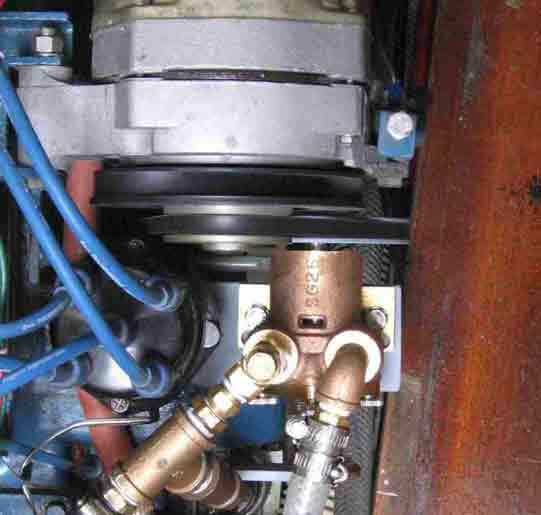 The most significant and unique aspect of this system is that the new raw water pump, a Moyer Marine unit, is driven by the existing belt drive which drives the alternator. 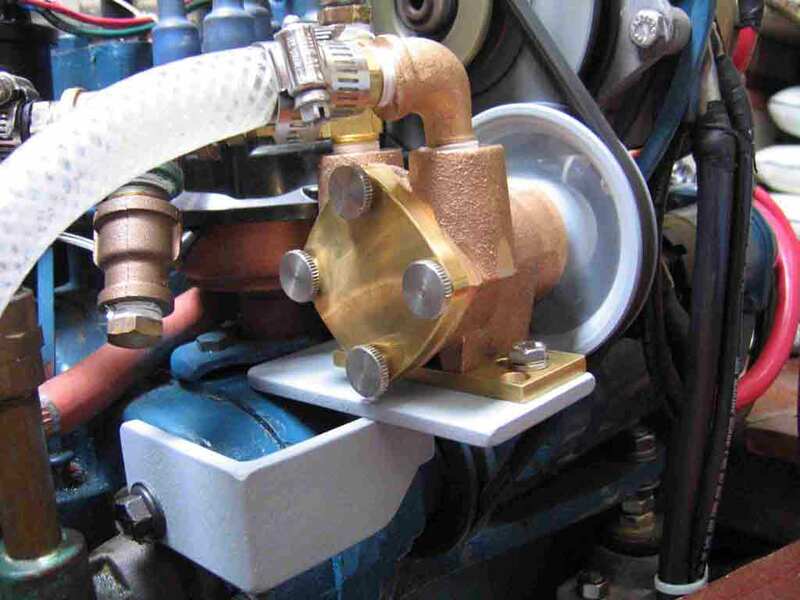 This compact design allows the system to be installed on most any vessel as the engine portion of the system fits within the existing engine envelope. In order to mount the pump on the engine, a special pump bracket is installed. To accomplish the installation, the upper bolt is removed from the existing water pump and the special bracket installed such that it rests on the accessory drive housing with one of the vertical supports against the starboard outboard surface of the accessory drive housing and the other support aligned with the hole from which the bolt was previously removed. A longer bolt is then installed in the pump bolt hole to locate and secure the aft end of the bracket. Belt tension provides sufficient force to keep the pump and bracket securely positioned against the accessory drive housing. The Heat Exchanger is an all copper "shell and tube" design with 4 passes. Raw water circulates through the tubes. The existing pump becomes the circulating pump for the antifreeze mixture which will circulate between the engine and the Heat Exchanger and circulates around the tubes. The Heat Exchanger is designed to operate totally full of antifreeze at a pressure of about 5 psi with an antifreeze recovery bottle provided to collect and return antifreeze to the system. A bracket is provided for mounting the Heat Exchanger to a convenient vertical surface but it can also be mounted at up to a 45 degree angle if space does not permit a vertical installation. The current thermostat configuration is still utilized which, on Late Model A4s, includes the bypass hose which runs from the side plate "T" connection to the thermostat outlet housing under which the thermostat is housed. As with Raw Water Cooling, it is critical that the internal bypass "boss" in the outlet housing be as designed and not wasted away after years of salt water attack. (it may be worth while to look at yours if you have not done so in a while. The "boss" control surface which the thermostat closes against should be flat with no craters in it and no more than 7/16" below the housing gasket surface). An improved Thermostat Kit, which eliminates the current thermostat and bypass hose, is offered as an option ($115 with purchase of FWC, $130 otherwise). An additional Product Improvement is the Belt Tension Device which makes adjusting the alternator belt tension a snap. 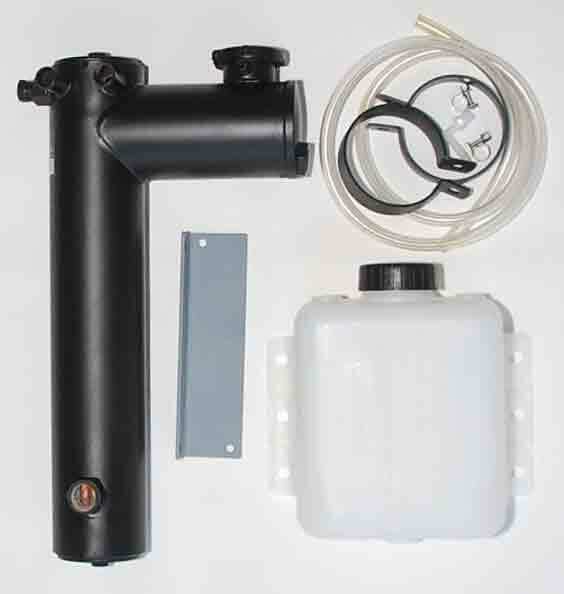 The kit comes complete with Heat Exchanger, Coolant Recovery bottle (shown to Right) and all hose fittings, clamps, hardware and mounting brackets. The only material not provided is 1/2 inch and 5/8 inch heater hose for the connection of the various components as each installation is very much different with regard to the location of the heat exchanger. Thank you for your interest in the Indigo Electronics AT-4CCooling System. Fresh water cooling not only prevents deterioration of the block and the manifold, but it allows the engine to run at higher temperatures (170-180 F) promoting improved combustion and performance.